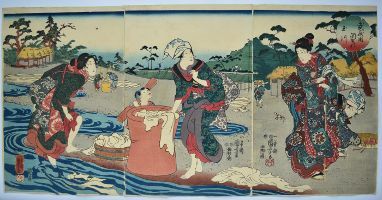 A triptych showing three women washing clothes in a stream from a set Six Tama [Jewel or Crystal] Rivers, this being the Chofu Crystal River (in fact the Tamagawa that flowed into Edo Bay). Musashi no kuni Chofu no Tamagawa. 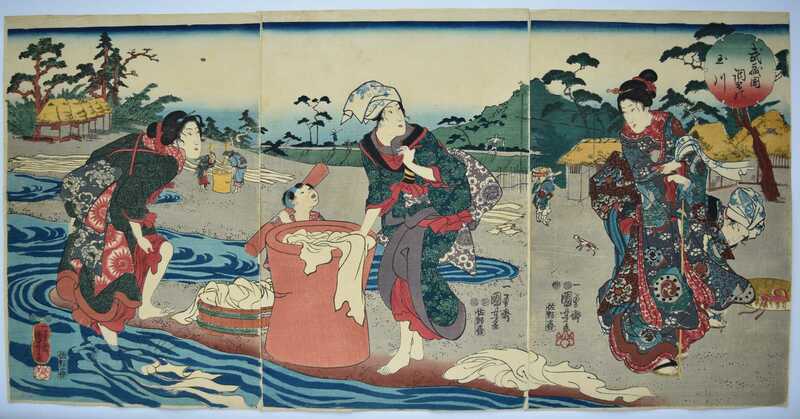 The set published by Sanoya Kihei, c 1847. The complete set is illustrated in The Baur Collection, Matthi Forrer, vol. II, 1994, nos G396-G401 (this being G397).